LesRuches – or “The Hive” – is inspired by bees who are long regarded as models of industry and purity as they are a symbol of eternal love in many cultures. 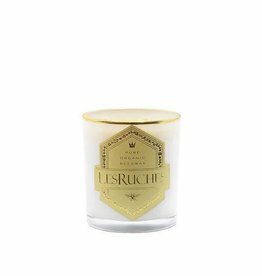 Beeswax has been highly prized since ancient times and LesRuches pays homage by creating the healthiest, most luxurious beeswax candle collection. Our candles are hand poured in small batches with pure organic beeswax and exotic essential oils, complete with 100% lead-free cotton wicks for a fervent burn. LesRuches’ signature golden yellow wax is all natural and is free of colorants. As our candles burn, they emit negative ions, cleaning the air around, rejuvenating the body.